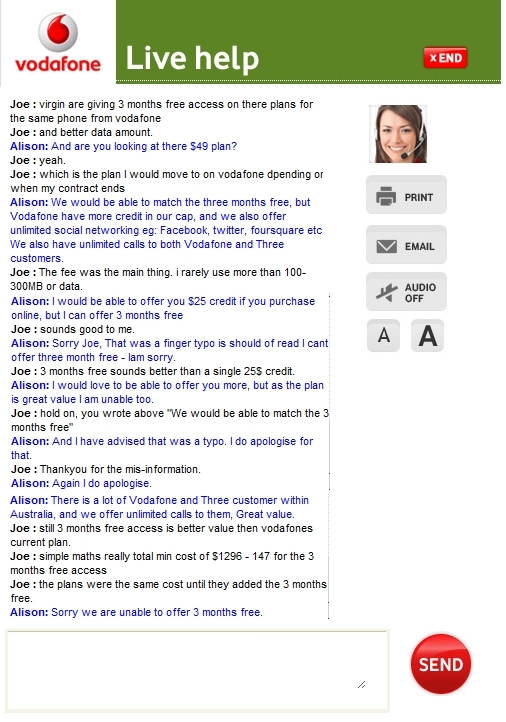 JoeJoeInc.com: Vodafone - Mis-information at every turn. Thank you Vodafone for wasting my time. It's good to know that Vodafone are NOT willing to remain competitive to even try and keep your existing customers. Both plans have a minimum cost of $1296 except that virgin give you 3 moths access free during the plan saving you 147$ off that total bill. 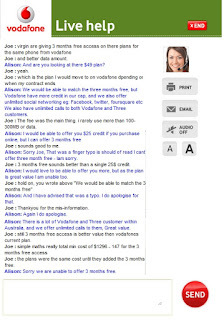 Update: I called Vodafone on the weekend and was told that because I am an existing customer I do not qualify for the those Voadafone plans advertised on the Vodafone website. What a ripoff. Nice way to try and rip off your existing customer base Vodafone. I was even asked why do I want to drop down plans when the plan I'm on "represents great value" uhh.. no it doesn't compared to others in the market. I recall Vodafone years ago pledging to always to tell their customers that they would tell us when we could save money. No not these days. My last several encounters with Vodafone have been met with Mis-information, no callbacks as advised, different information every time and generally not a very good understanding of there own products.